MICROBIAL BIOTECHNOLOGY: SCOPE, TECHNIQUES CONTD..
circulates in the plasma,where it contributes to atherosclerosis (formation of plaques on the walls of the arteries supplying the heart, the brain, and other vital organs). For delivery to tissues, plasma cholesterol is packaged in lipoprotein particles;two thirds is associated with low-density lipoprotein(LDL) and the balance with the high-density lipoprotein. population and results in elevated plasma levels of cholesterol-bearing LDL. Microbial Biotechnology: Scope, Techniques, Examples Continued..
Microbial Biotechnology: Scope, Techniques, Examples. Microbial World. p. vii, Englewood Cliffs, NJ: Prentice-Hall, Inc.
metabolism of thousands of prokaryotes and fungi provides an indispensable complement to the sequence database. 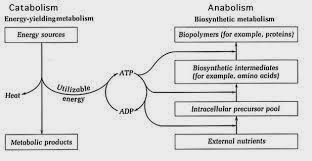 METABOLIC PATHWAYS FOR BIOSYNTHESIS OF INDUSTRIAL MICROBIOLOGY PRODUCTS CONTD.. The main source of carbon and energy in industrial media is carbohydrates. In recent times hydrocarbons have been used. The catabolism of these compounds will be discussed briefly because they supply the carbon skeletons for the synthesis of primary as well as for secondary metabolites. The inter-relationship between the pathways of primary and the secondary metabolism will also be discussed briefly. four pathways exist in bacteria, actinomycetes and fungi, including yeasts. The four pathways are the Embden-Meyerhof-Parnas, the Pentose Phosphate Pathways, the Entner Doudoroff pathway and the Phosphoketolase. Although these pathways are for the breakdown of glucose. Other carbohydrates easily fit into the cycles. phase of the growth curve. Following the trophophase is the idio-phase (Greek, idio = peculiar) during which secondary metabolites peculiar to, or characteristic of, a given organism are synthesized. stationary, phase. It has been suggested that secondary metabolites be described as 'idiolites' to distinguish them from primary metabolites. of the physiology of industrial organisms will be discussed. ASPECTS OF MOLECULAR BIOLOGY & BIOINFORMATICS RELEVANCE IN INDUSTRIAL MICROBIOLOGY & BIOTECHNOLOGY CONTD..
analysis of the collective microbial genomes contained in an environmental sample. use PCR to amplify gene cassettes or random PCR primers to access genes of interest since these methods do not provide genomic information beyond the genes that are amplified.